Even during their active sporting careers, Hanni Wenzel and Harti Weirather handled their own marketing as well as that of many sporting colleagues, leading to the foundation of their marketing agency Weirather – Wenzel & Partner – WWP in short – in the mid 1980’s. Weirather triumphed on the Streif in 1982, setting a whole new track record in the process, one that remained unbeaten until 1992 when it was taken anew by Switzerland’s Franz Heinzer. No one ever dreamed back then that his WWP Agency would one day handle the marketing for the Hahnenkamm Races. His wife, Hanni Weirather-Wenzel, won no less than four Olympic medals, two in gold and a total of nine World Cup medals (4xgold). She took to the World Cup winner’s podium an astonishing 89 times, with 33 outright wins and 6 overall World Cup titles. Even before Harti took over the marketing of the races in Kitzbühel it was his wife Hanni Wenzel Weirather that poured champagne for the celebrities back at the Zielhaus. They approached this project with commitment and diligence. Harti was already actively involved in Formula 1 with partner Burghard Hummel, so it was only logical that they and their company wanted to market the Hahnenkamm-Races. The time came on 22nd January 1996, when those responsible at K.S.C. signed the first contract with Weirather for the years 1997 to 1999 - and WWP has been the Kitzbühel Ski Club (K.S.C. ), Hahnenkamm Race Organizers, partner ever since. Hanni Weirather-Wenzel and Harti Weirather were awarded the “Gold Medal of Honour” by Kitzbühel Tourism on Friday, 8th July for their services to Kitzbühel. Our sincere congratulations go to Harti and Hanni and we would like to take this opportunity to thank them for their tireless efforts with regards to the K.S.C. and the Hahnekamm Races. 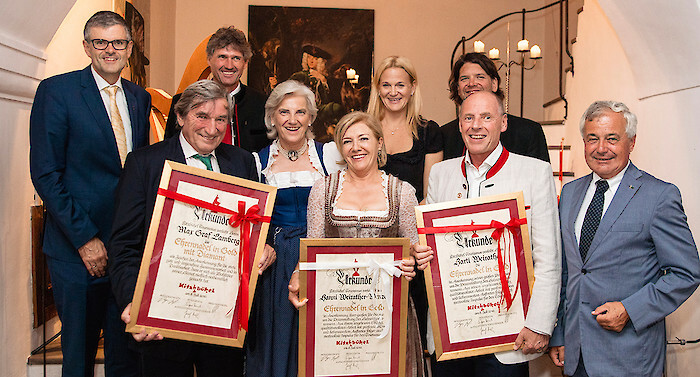 Kitzbühel Tourism also honoured Count Max Lamberg with the “Gold Medal of Honour with Diamond”, for his positive contribution to Kitzbühel. Congratulations! Incidentally, the awards ceremony was held within the auspicious walls of Kaps Castle.